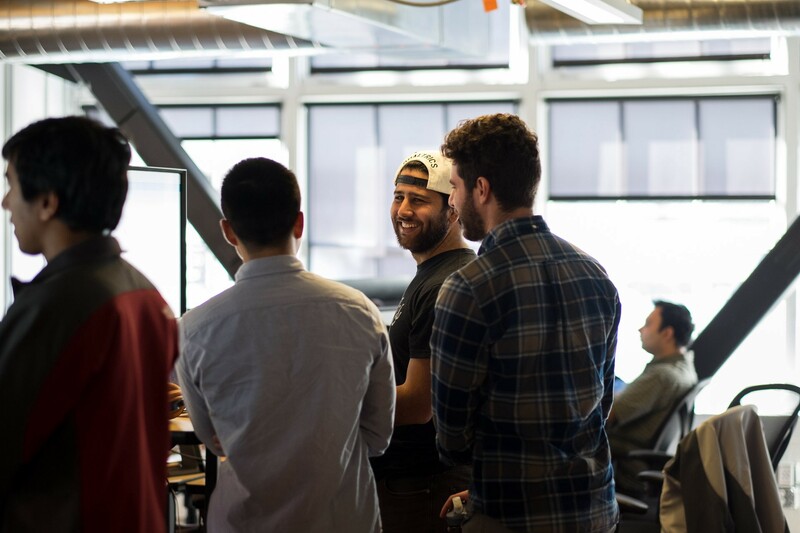 For this interview, Job Portraits spoke with Senior Director John Thimsen, along with software engineers Mahdy Khayyamian, Ben Bromage, and Alexia Newgord at their Seattle office, near Pioneer Square. 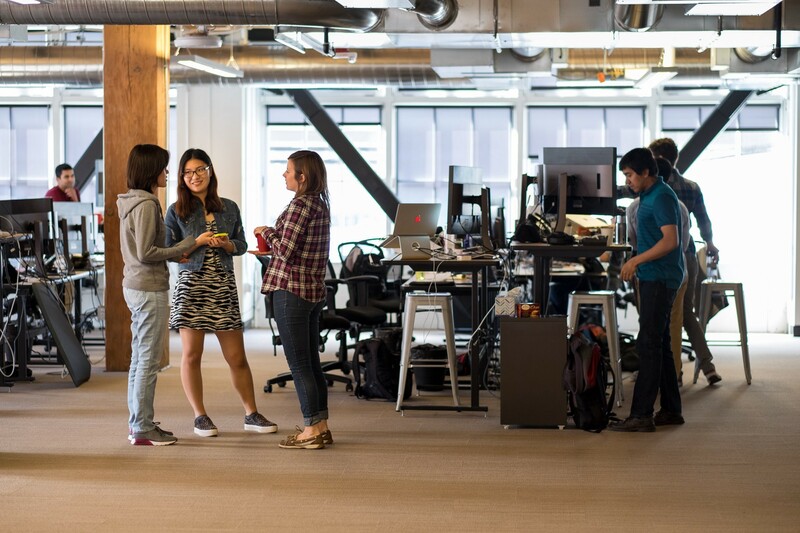 Check out open positions with the team here. 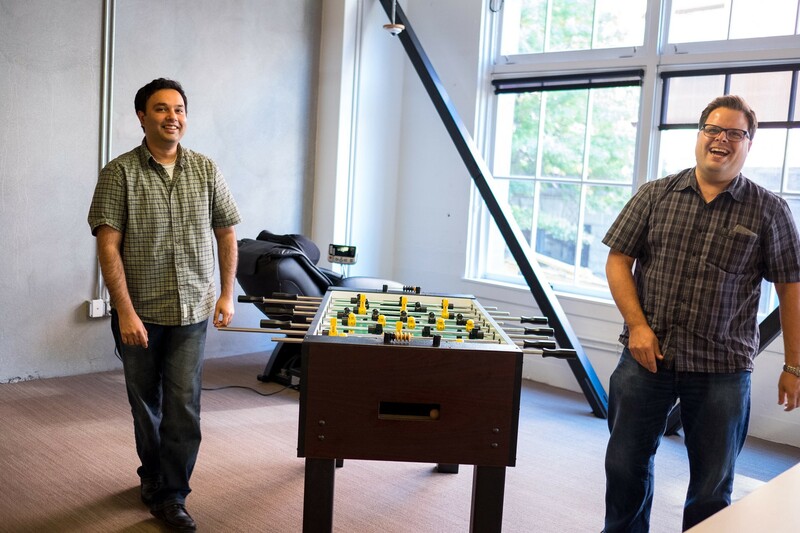 Left to right: Software engineers Mahdy Khayyamian, Ben Bromage, and Alexia Newgord, with Senior Director and Seattle Site Lead John Thimsen. What does Qualtrics do and why does it matter? 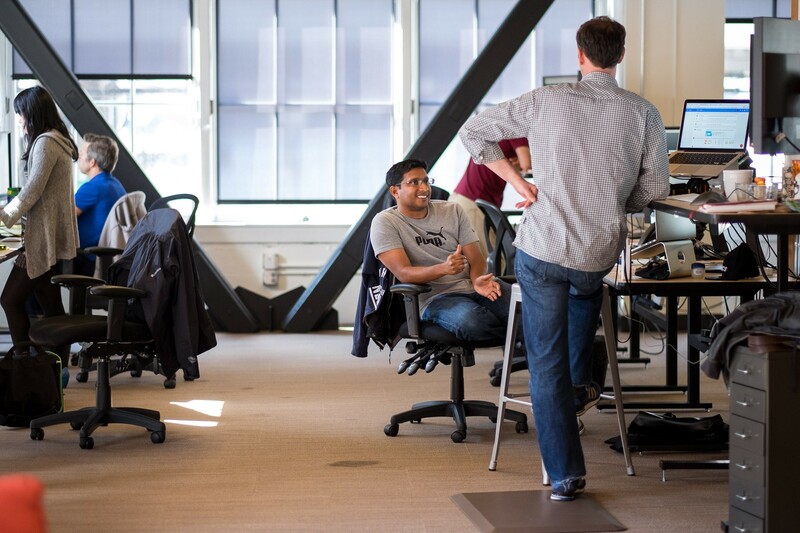 Ben: We build software that helps companies improve customer satisfaction. That starts with customer surveys, then, here in the Seattle office, our main focus is building a tool to visualize that data. The platform is called “Vocalize” and it allows companies to build a “voice-of-the-customer” program. VoC programs increase customer satisfaction using data-driven methodology developed by our founders. John: For example, one client has a very complicated, multi-phase workflow starting when the customer first calls in and ending with delivery. They’re using Qualtrics to measure every aspect of that customer journey. We also work with a retail business that has hundreds of locations. They’re using our software stack to do in-store customer surveys to drive customer satisfaction improvements. 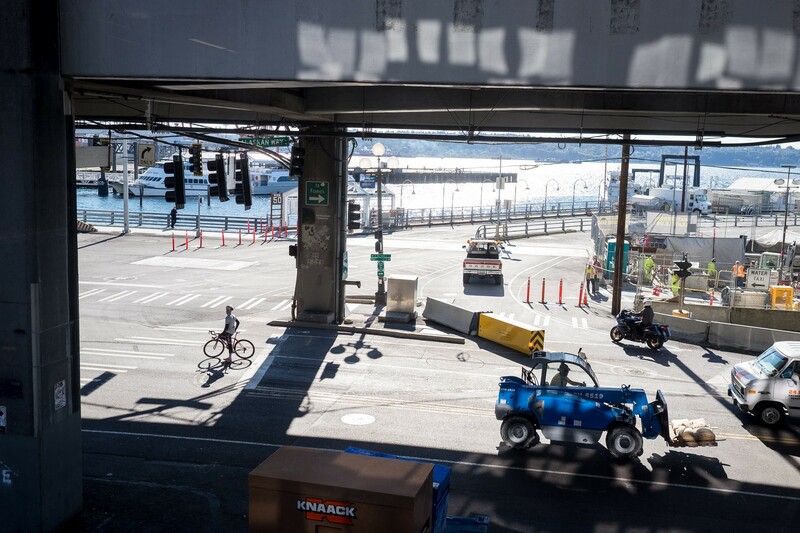 Above: Alan Wang (left) and Sophie Huang review code near a sign, mimicking the Pike Place Market nearby, that was built for the new office’s open house. Below: Chowdhury Yeameen, Chao Lai, Matthew Al-Sheikh, and David Siegle (left to right). Above: Sujit Vatenky (center) chats with Ben Bromage. 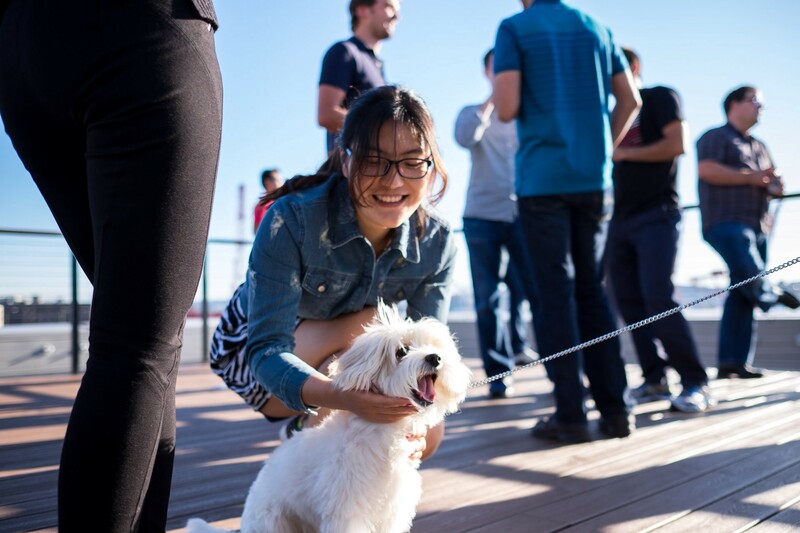 Below: Tom Lehmann (in back), Owen Hancock (engineer number five at Qualtrics) with Rebecca Leong and Albert. 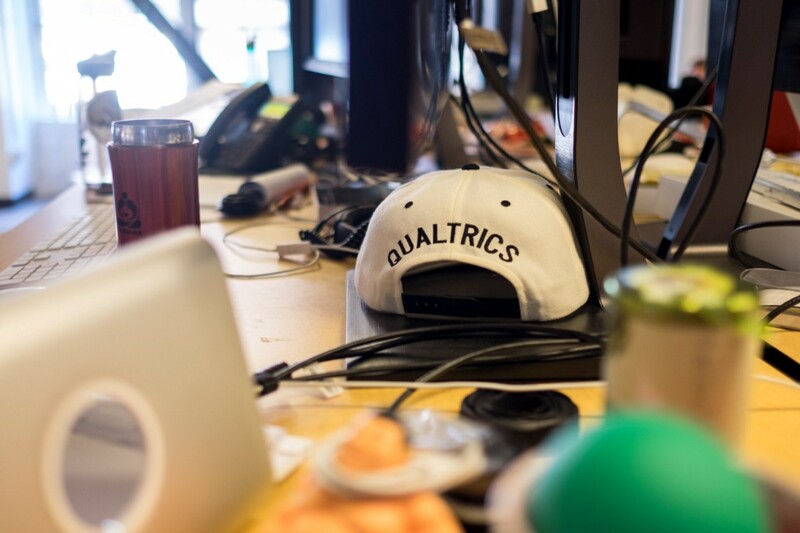 Tell us a about the history of Qualtrics and where the company is now. John: We were founded in a basement 13 years ago by two brothers, Jared and Ryan Smith, their father, Scott, and Stuart Orgill. The original product was sold to academic customers. When those students entered the private sector, they brought Qualtrics along, and we saw a huge increase in interest from the corporate world. The company’s been based out of Provo, Utah, for about ten years. In 2012, we decided to raise money from Sequoia and Accel. 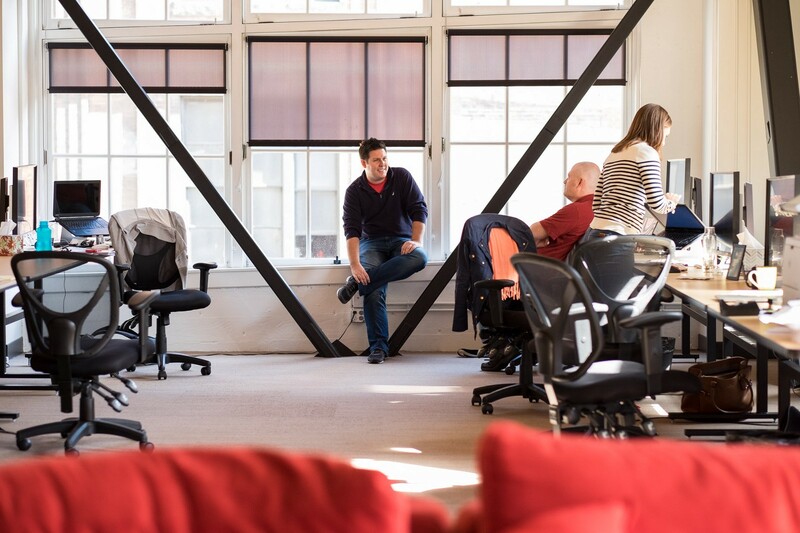 As we’ve seen growth continue to accelerate, we decided to open a second engineering office. 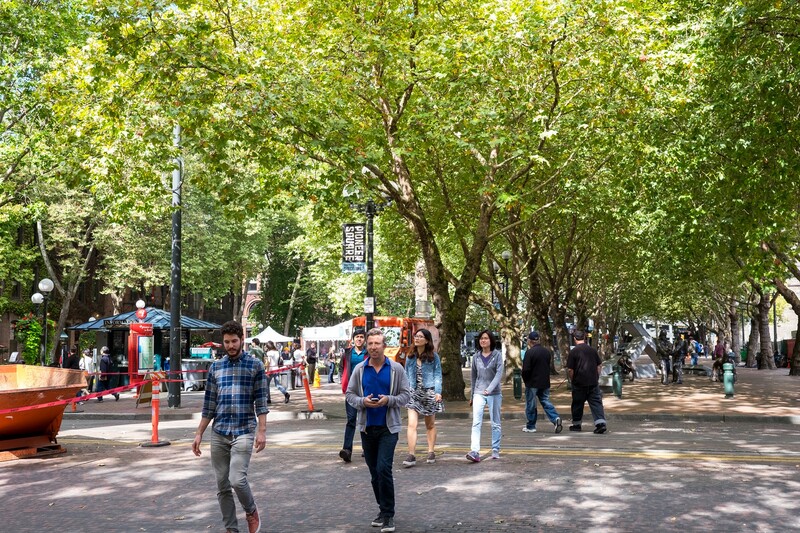 We choose Seattle for a number of reasons — great talent, the city has a ton of character, and it’s also a non-stop flight from Salt Lake City. We know data visualization is a hot topic these days. How does Vocalize incorporate it? John: Vocalize is part of a larger data-driven insights platform that Qualtrics is developing. Today, to learn from your data, it often takes a human to slice and dice to something insightful. We’re working on developing machine-learning techniques that automatically highlight key drivers. For instance, our platform can alert our customers, in real time, that there has been a change in their customer satisfaction, and here’s why. Then the client can address the problem immediately. Creating a DIY data visualization platform that is intuitive and fast is a really interesting challenge. We spend a lot of time thinking about how we can build a UI that allows our customers to have the best data visualizations in the world. We’ve got a pretty good start, but there’s a lot more work to do. Above: David Seigle (left) and Asad Jawahar grab some pizza. 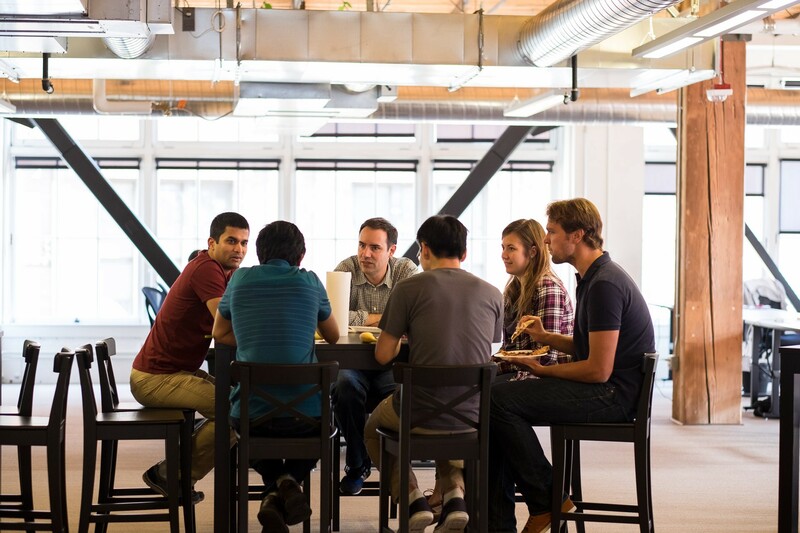 Below: Part of the engineering team gathers for lunch. Above: Mahdy Khayyamian (left) and Rama Vetrieval shoot pool while Owen Hancock works on the office’s unicycle. Once chewed, the gumballs are meant to be applied to the Qualtrics brick wall behind the pool table, recreating the famous Market Theater Gum Wall. Below: John Thimsen (right), known as the office’s top foosball player, celebrates another win. Tell us about the projects each of you is working on. Alexia: I’m a software engineer on the client engineering team. We help fill in the gaps where our current product doesn’t necessarily meet our customers’ needs. Currently, I’m working on a bivariate analysis visualization that will likely get woven back into the main product. It’s really neat that I’m so new to the company and I’m already developing something that could be widely adopted. 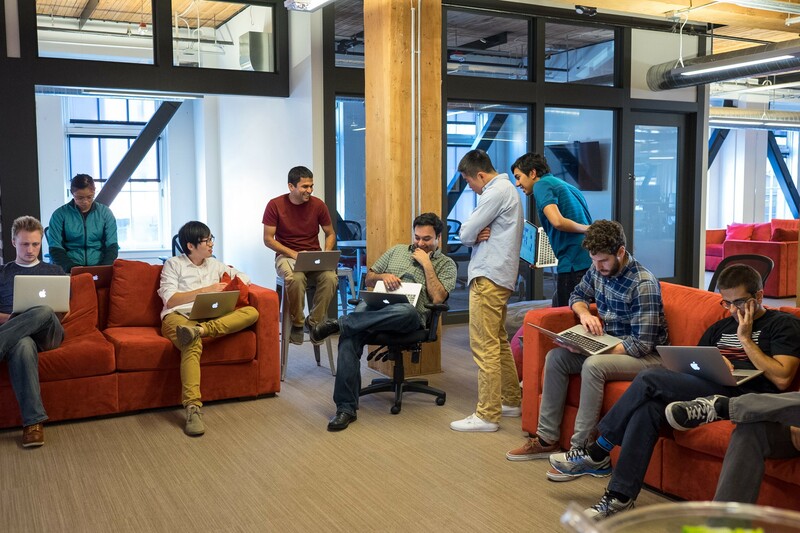 Mahdy: I’m a software engineer on the Vocalize core team. 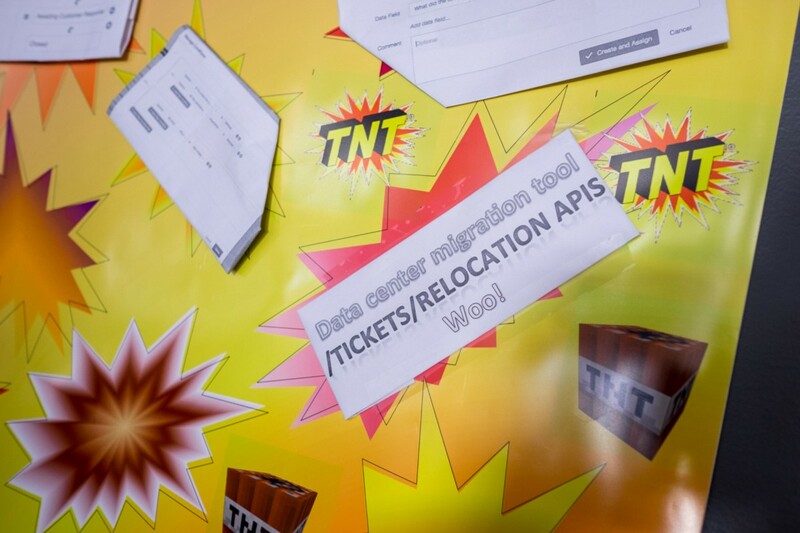 We’re the people who figure out how to import data from different sources, and we also build core features around data-permissions and reporting. When I joined Qualtrics, I was assigned to a really big project right away. My team developed a weighting feature that lets companies adjust survey targeting to the actual distribution of their customers across different demographics and cohorts. John: Mahdy had a huge hand in defining the response weighting feature, including the UI and UX. That’s pretty typical here, but at other companies it’s rare for a single person to touch every part of the product development cycle. 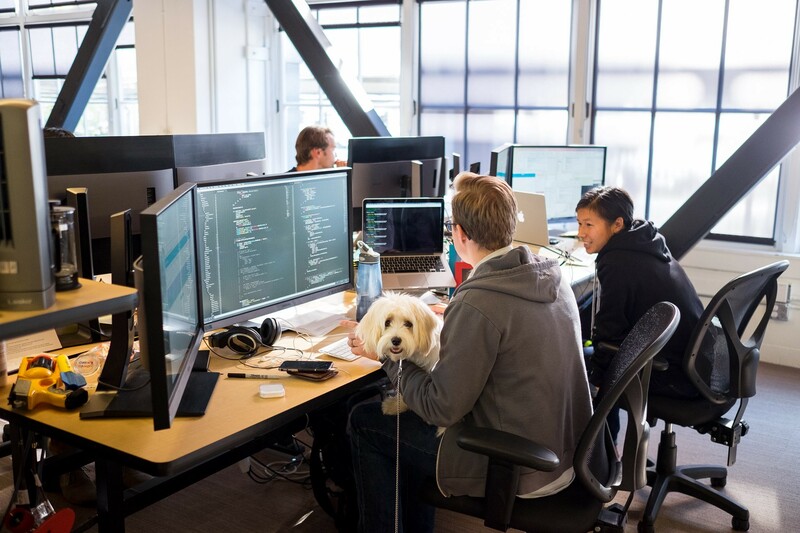 From requirements gathering, to interaction design, to go-to-market, to support — engineers here have a hand in it all. 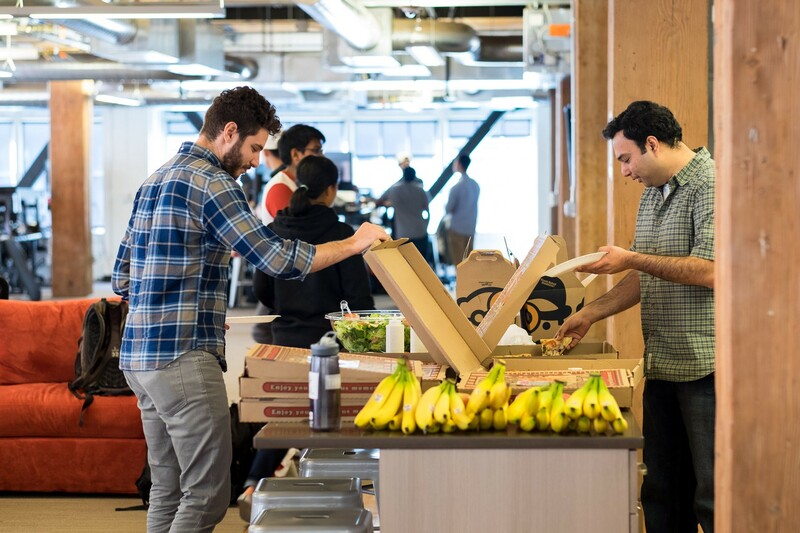 Ben: Previously I worked at Amazon for seven years as a software development engineer in test. 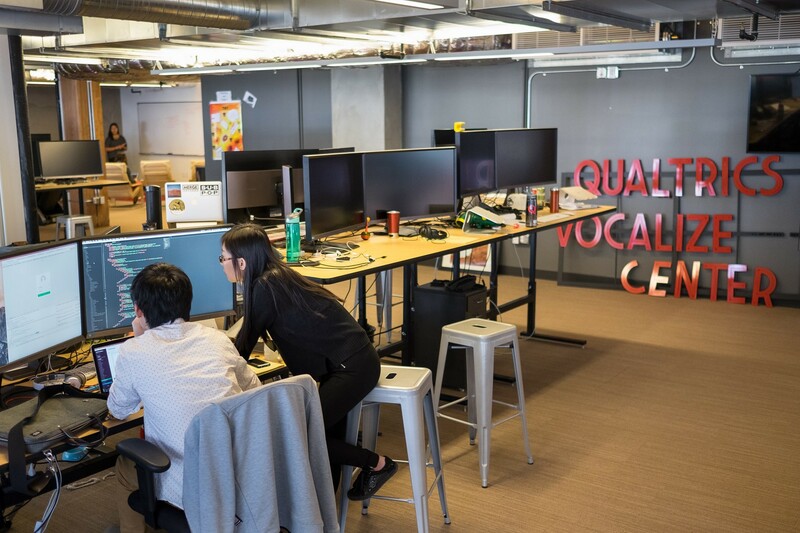 At Qualtrics, I have the same role, but I was the first SDE-T in this office. Since the engineering team was already up and running — and building quickly — my philosophy has been to provide tools and frameworks that are integrated into the development process, using technologies that the engineers are already using on a day-to-day basis. What technology are you working with? What’s your stack like? What’s a typical day like here? John: There are no set work hours, but people will show up between 8 and 9:30 a.m., and they’ll leave between 5 and 7 p.m. Pretty standard for Seattle. When we’re crunching to get something done, people will occasionally lean in a bit more to hit deadlines. I’m sure Mahdy can tell you about that. But I’m deeply aware that this is a marathon, not a sprint. I’ve been in environments where people burn out, and we don’t want that. 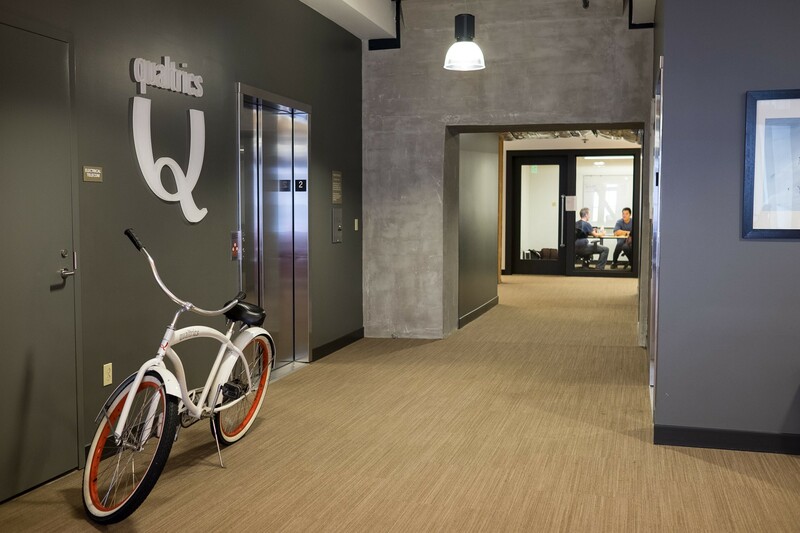 Above: A Qualtrics bike awaits a rider in the office’s entryway. Below: Four simultaneous conversations during a day of new-grad interviews. Above left: Senior technical recruiter Mike Spaulding (in town from Provo) chats with the local recruiters. Above right: Tom Lehmann (left) and Alexia Newgord. Above: Recruiter Jenny Hamann-Acosta in the office’s main conference room. Below left: A wall celebrating recently finished projects. Below right: Matthew Al-Sheik’s desk. Above: Matthew Al-Sheikh (left) and Chowdhury Yeameen (center) near the bank of windows that looks out on the scene below. 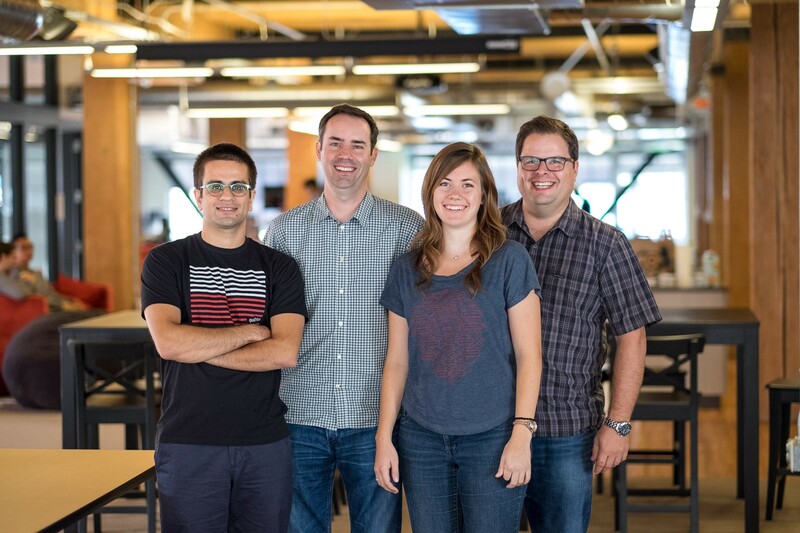 Why did each of you decide to work at Qualtrics? Alexia: I graduated in May and was hired straight out of school. The main reason I came here is that you get your hands dirty right away. Within the first week, I had already pushed a bug fix to production, which is amazing. We have really good software practices, with continuous integration and deployment. People here are also really excited to get you on board. It doesn’t take long to feel like part of the team. Most college hires get an official mentor here, but everyone is willing to help you. Before I joined, I had never done front-end programming; here I play a role in the entire development lifecycle. I’m seeing how the front end works, the back end, and everything in between. Mahdy: What attracted me to Qualtrics is that it has the financial stability of a big, profitable company, but it’s run like a startup — very fast-paced. We have two-week sprints, teams do a standup meetings every morning, and then we have retrospectives at the end of every sprint. Because we use agile, we collaborate faster and deliver better results. Ideas can go from sketch to production in weeks, not months. It’s pretty cool to see features launch so quickly, and then we get direct client feedback within days. That lets us resolve issues very quickly. Ben: One of the things I immediately noticed when I came here is that we’re encouraged to try new things. I’ve had previous jobs where managers were data-driven in a very conservative way. If I had a new idea, they’d say, “Okay, demonstrate the value of this idea, and then we’ll decide if we want to move forward with it.” There’s value to that approach, but here we care more about speed. If you have a new idea, everybody says, “Great! Try it and let’s see what happens.” And if your idea doesn’t work? Then you learn, iterate, and try again. 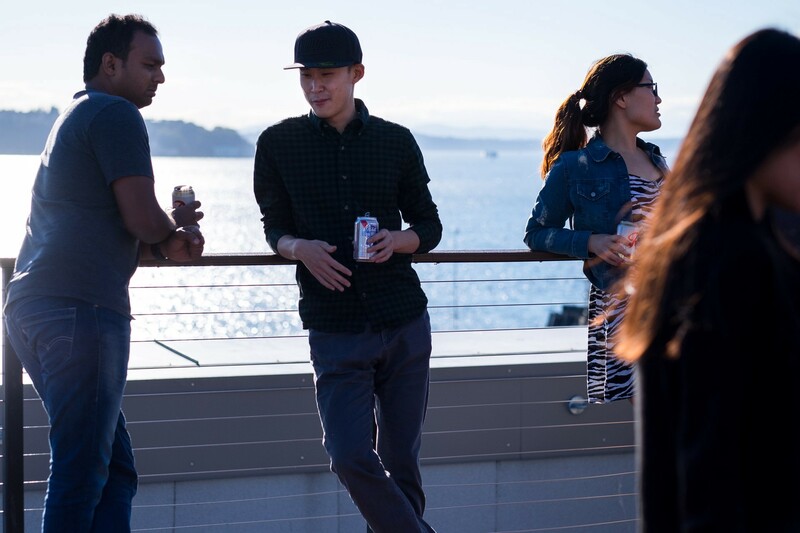 Interested in open positions at Qualtrics? Check out their career page. 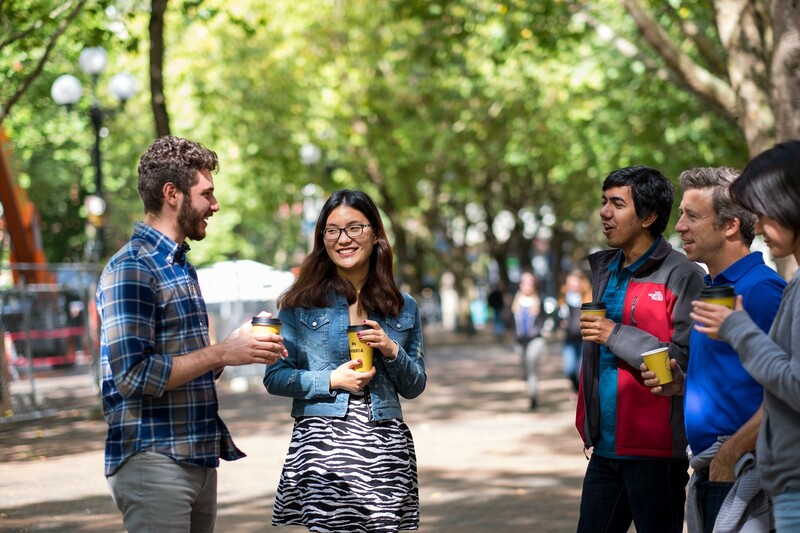 Above: Shane Liu (left), Sarah Liu (center), and Alexia Newgord discuss a coffee break. 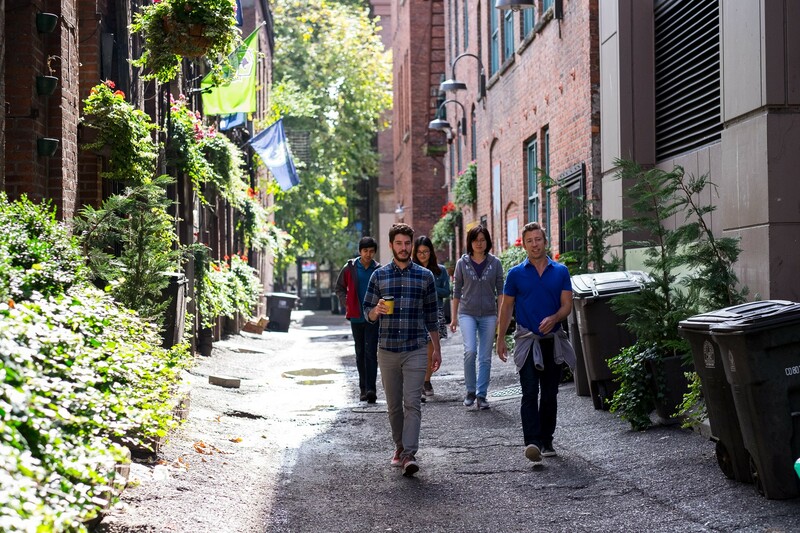 Below: David Seigle, Chowdhury Yeameen and Scott Anson (left to right), join Shane and Sarah for a quick walk through Pioneer Square on the way to their afternoon caffeine fix. Above: In line at the coffee shop. Below: Chilling in Pioneer Square. Bottom: Heading back through one of the neighborhood’s characteristically verdant alleys. What kind of person would love working on this team? Alexia: Someone who values transparency, customer obsession, and is interested in pushing technical boundaries. Mahdy: Technically speaking, someone who is really good with one programming language but is eager to learn others, and someone who has a good background in data structures and algorithms. Also someone who is collaborative and easy to work with. Ben: To build on that, it’s important that people are comfortable being open and owning their mistakes. This is not a finger-pointing environment. We have an all-hands meeting every week, and during that meeting you can self-nominate to talk about a mistake you made the previous week. Whoever made the biggest, most ridiculous mistake gets to have Whoops the sock monkey sit on their desk. People love it. If you are not used to being so open with your mistakes, that can be an adjustment. Transparency is a huge part of our culture; it makes it okay for us to try something, screw up, learn from it, and do better. John: Someone who insists on the highest standards, but in a way that’s respectful to their peers. And ultimately, the goal is to delight our customers, so you need to truly care about helping them. One thing I love about the team is that they are pragmatic; we get something in front of customers and then iterate. If you want to experience the most professional growth in the shortest amount of time, and own more of a product than you’ve ever owned, then we’re the right shop for you. Is there someone who might not enjoy working here? Ben: If somebody wants to specialize in one thing and then sit on that specialty for years, then this isn’t really the place for them. We’re looking for people who want to do a lot of different things, who are interested in learning and growing in many directions. John: I agree with Ben. If you come in with a predetermined idea of what you’ll be working on and what technologies you’ll be using, you’ll be disappointed. We want garage entrepreneurs, the kind of folks who, if they weren’t at a company would be in their garage, tinkering with an idea or putting up a website. If you need a role with crisply defined boundaries or with a regimented set of responsibilities, this is not the right place for you. Things are moving so fast, job and team divisions can get blurry. So you need a personality that’s okay with continuous change. Joining our team is a bit like a choose-your-own-adventure novel. The outcomes are a little predetermined — but there’s latitude in selecting your path. When you join we talk about your strengths and interests, we’re transparent about what the business needs, and then we arrive at the best path together. That’s our model for on-boarding — I don’t see any need to strictly partition teams. Above and below: Chao Lai leads a weekly ops review, the responsibility of whomever was the on-call engineer the week before. 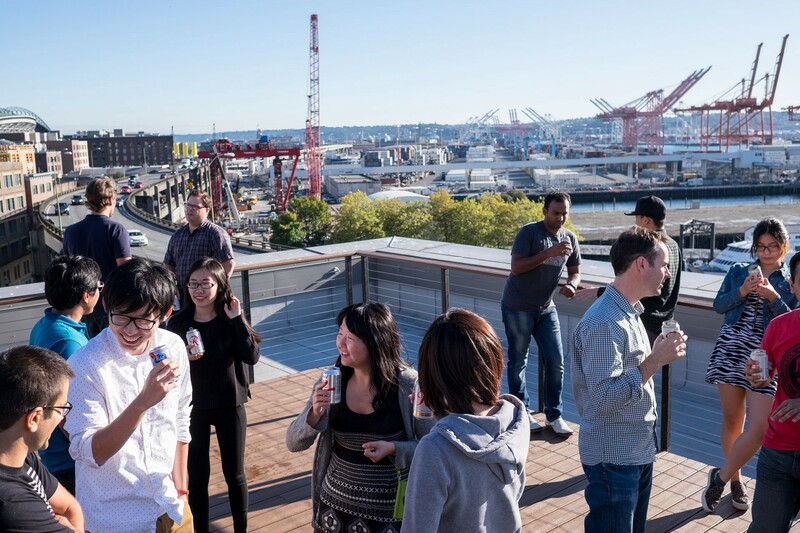 Above and below: The team gathers on the office’s roof deck for a casual happy hour. Do you have an ethos that sets you apart from other companies? Ben: Transparency is very important here, because it leads to an environment where the challenges are shared. 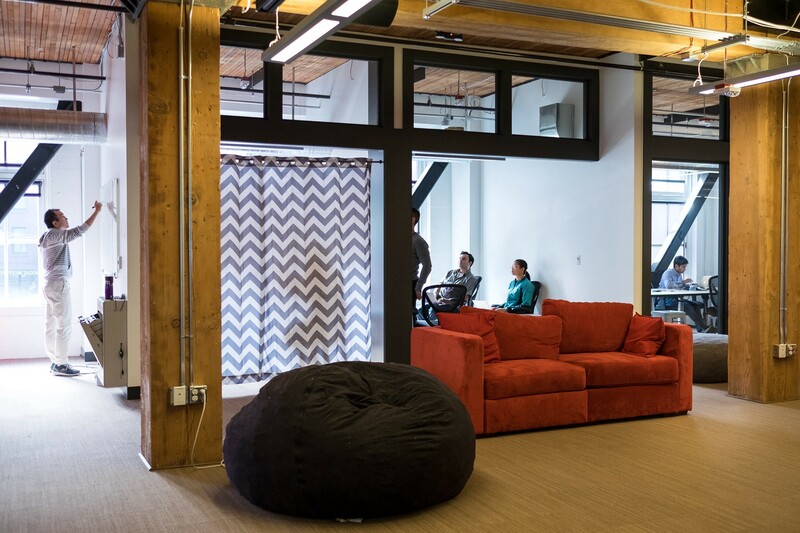 You can see it in how our office is laid out: we have an open office floorplan instead of cubes. If you’re stuck, or if you have something to say, you just walk over and get it resolved. 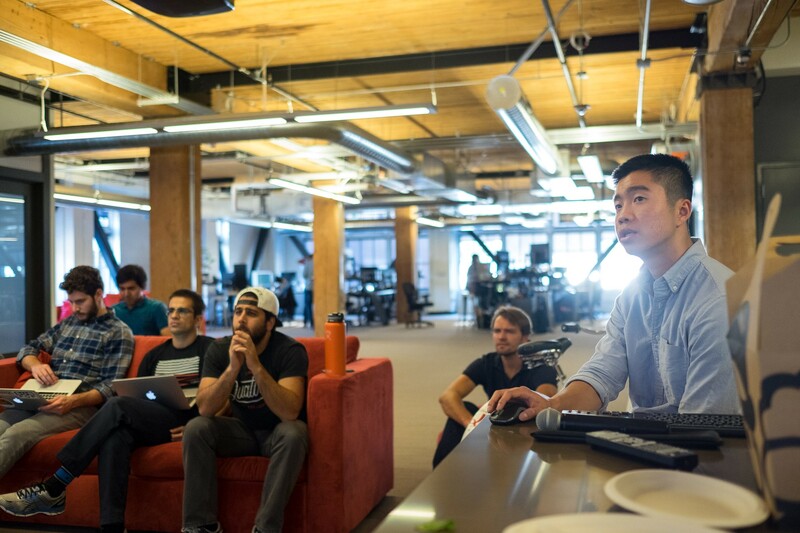 Nobody is alone — nobody gets points for spending a day on a problem that another team member could have helped you solve in five minutes. 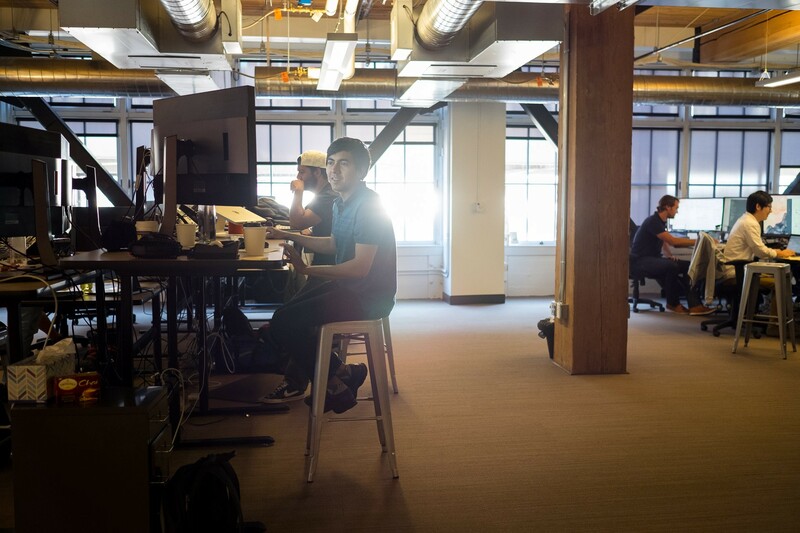 Mahdy: When I was at Microsoft, we had offices, so at first I was skeptical about the open space. But after a while I realized it really encourages collaboration. Like Ben said, you can just walk over to someone’s desk and say, “I have this problem, can you help me?” When you other people working, you’re more inclined to work together. Alexia: We get catered lunches on Monday, Wednesday, and Friday, and breakfast on Thursdays. That’s a really good time to talk with other people about life outside of work. We hang out together after work, as well, and a couple weeks ago we went kayaking. 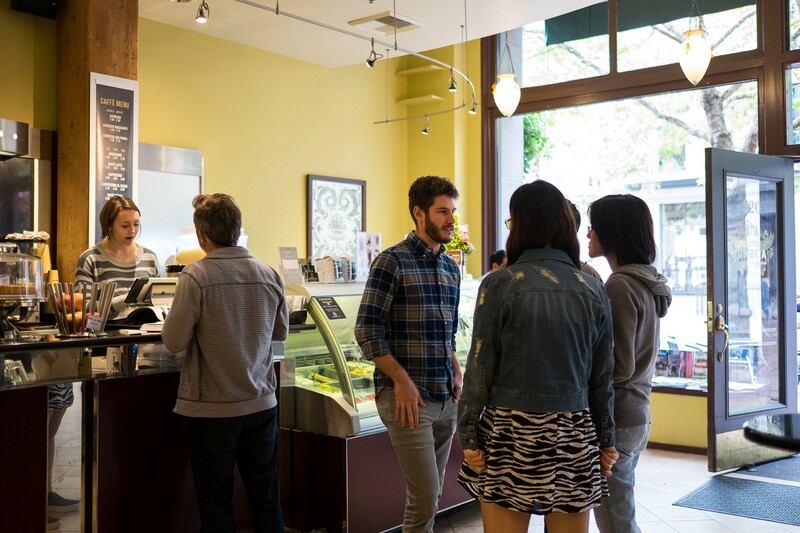 There’s a lot to do around Seattle, so it’s very easy to go find restaurants, happy hours, festivals, and other cool things in the city. John: Ben’s in a band, so we all go watch him play. Ben: Yeah, I’ve been playing music for longer than I care to mention. I play the drums. We even have a drum set in the Provo office. Maybe we should build a stage here, too? John: Yeah, our office in Provo is also awesome. You’ve got Park City, Sundance, and there are a bunch of really great outdoor activities. We haven’t hit a ski season yet, but this office will definitely ski, too. We have our share of bikers, as you can see by all the bikes in the office. That’s an important part of the culture here: we all enjoy the outdoors. It’s always a good time when we get together with Provo. 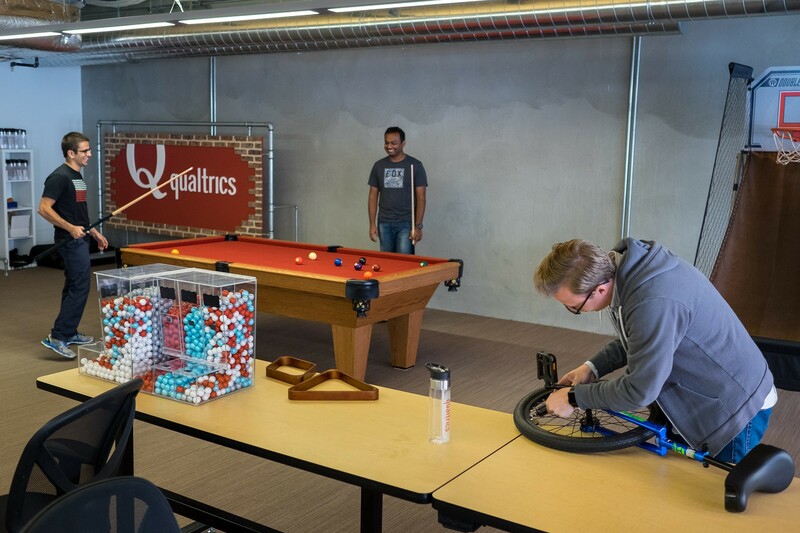 Interested in joining the Qualtrics engineering team? Visit their career page or contact Senior Technical Recruiter Mike Spaulding, mikes@qualtrics.com. 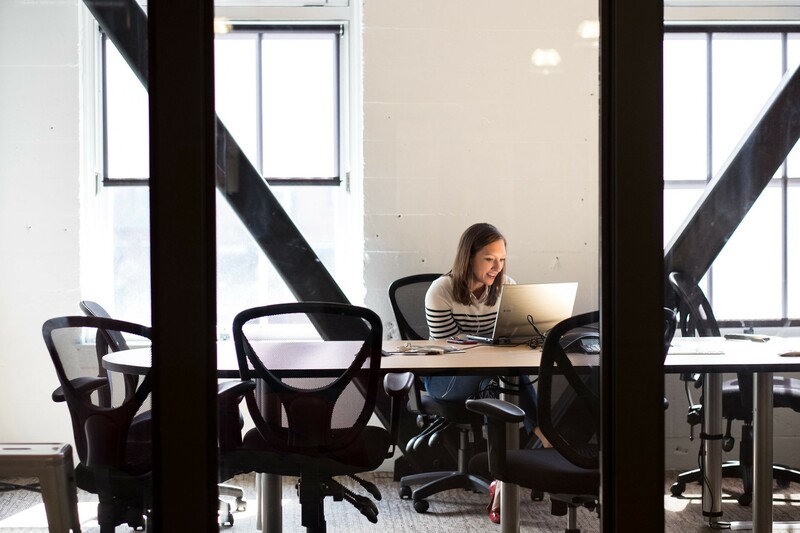 *This story was produced for Qualtrics by Job Portraits, a creative agency that helps highlight job openings at high-growth startups.